At the risk of adding to the already extensive noise on the very capable Samsung V2 SmartThings Hub, following is a brief high-level overview of this device and specifics as to why it is currently on Darwin’s Den’s Best Home Automation Controllers List and the top pick on the Must Have Home Automation Devices page. While the device and supporting cloud infrastructure is by no means perfect, I believe it can satisfy the itch of most general home automation enthusiasts. The SmartThings hub sports an impressive device and protocol capability including support for Z-Wave, Zigbee, and promised future Bluetooth LE support. For a description of these protocols and other criteria, reference the Home Automation Controller Feature Term Glossary. Samsung is obviously trying to cover as many bases as possible with this device, and includes support for IFTTT, Apple Watch, Amazon Echo, and Nest. The hub also offers battery backup, and although this is a welcome enhancement, review why you may still want to consider a UPS as part of your system even if your controller includes a battery backup. In this new era of form-does-not-follow-function weird alien spider device box design, the SmartThings hardware stands out as being either simply refreshing, or arguably uninspired. I’m certainly not complaining about the lightweight white square-ish box. Samsung appears to be focusing more on function than form, and they did well to keep this controller under $100. I would much rather have them concentrating on the internals and software capabilities than the physical box. 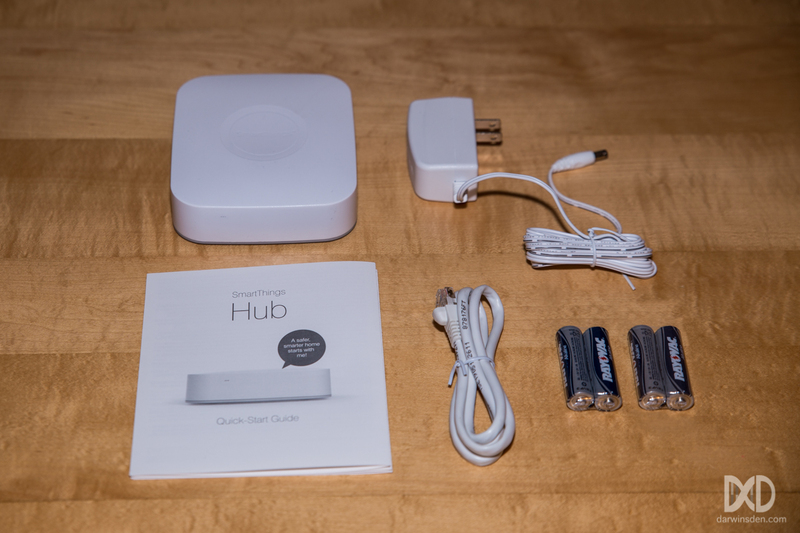 The package contents include the 5″x4.5″x1.25″ hub itself, a 5V, 2A AC/DC power adapter, ethernet cable, the SmartThings Hub Quick Start Guide, and 4 AA batteries (which gives the otherwise featherweight unit enough heft to keep it from flying away in a strong wind). Samsung claims about 10 hours of battery-powered hub operation in the event of a power outage. The back of the unit includes a reset switch and unlabeled ports for the power adapter, ethernet, and two USB connections, which Samsung says are for future USB expansion capabilities. Initial set-up requires that you connect your hub to your home network via its ethernet port, download the mobile app for either Apple IOS, Android, or Windows mobile, and set-up an account on the SmartThings cloud. Within minutes of setting up my account, I was able to add several of my existing wall switches, energy monitors, flood sensors, and a Nest thermostat to the hub. The SmartThings interface has a convenient method to first exclude your Z-Wave devices from any previous network, so I did not need to manually reset the devices or even access the hub that was controlling them before. The back of the SmartThings V2 hub. SmartThings has a very strong user community that is constantly improving the base capabilities of this unit using the SmartThings web-based Integrated Development Environment (IDE) based on the Groovy language. 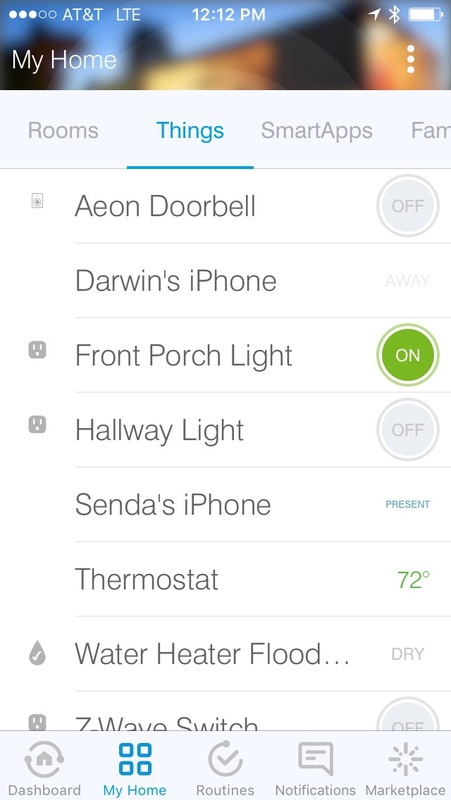 Some of the most useful capabilities for the SmartThings hub come from user-developed content. After adding my devices, I also installed a user developed Rule Engine using the SmartThings IDE. There are a couple of 3rd party rule engines available that fill this glaring gap in the base system. For Apple IOS users, the $9.99 Smart Rules is a very straightforward way to add simple rules to your devices. For IOS and Android users – and those with more complex scenario needs, the free CoRE (Community’s own Rule Engine pioneered by Adrian Caramaliu) allows for extremely sophisticated rules and triggers. I also added a virtual switch device handler to the hub and defined it as a “Rain Mode” that can be toggled by current weather conditions via IFTTT for incorporation into garden watering rules. SmartThings SmartTiles Web Client running on an otherwise unused iPad. In general, I’ve been pleased with the SmartThings Version 2 Hub. The software has been fairly stable for me, although the mobile app is at times bewilderingly confusing. Many of the hub’s automation triggers are still able to operate if your internet connection is lost, however, you will not be able to directly control your devices from your mobile device without an internet connection, even if you are connected directly to your home network. Despite this internet dependency, direct device control is very responsive, with hardly any perceptible delay. The SmartThings automatic rules or actual automation capabilities, such as lighting automation, home monitoring, general push and text notifications, as well as the aforementioned CoRE are provided by SmartApps that need to be installed from the Marketplace menu. The SmartApp capability is perhaps one the SmartThings Hub’s greatest strengths as well as the most confusing aspect of its mobile interface. While these apps support a great deal of flexibility and customization, including the ability to write your own rules or use code developed by others, there is little consistency in their naming conventions and interfaces, and often quite a bit of overlap in their capabilities. The ability to write your own device handlers and SmartApps using the SmartThings web IDE environment is an impressive and powerful feature. Groovy is a robust programming language, well suited for device driver and smart application/rule development. Even if you don’t have the desire or knack to develop your own capabilities, there’s a good chance the SmartThings community has what you are looking for, or is willing to help develop it for you. If you’ve just recently acquired a SmartThings Hub, before you get too frustrated with SmartThings default SmartApps and user interface, I recommend installing CoRE on your system and giving it a try. Unfortunately, since Samsung does not currently allow this user developed capability to execute on the device itself, these flexible utilities often come with a several second cloud execution latency price. 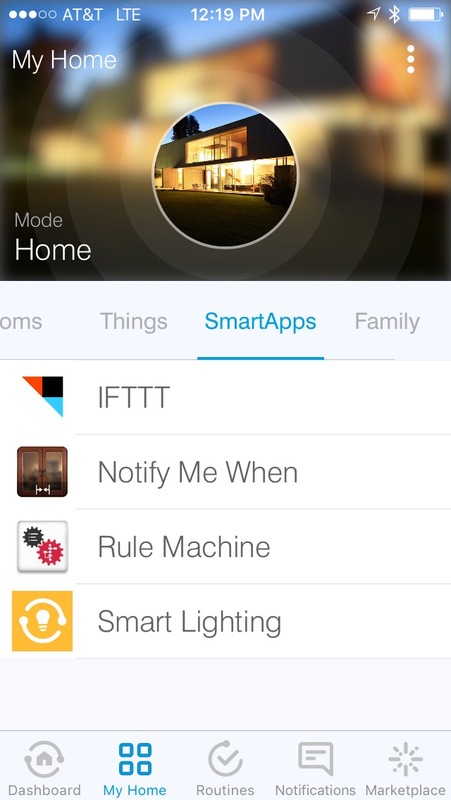 If you plan on integrating IFTTT, also adding a virtual switch that can be set by IFTTT recipes is very handy. If you would like the capability to view and control devices from your desktop – or are looking for simple controls for a handheld or even wall-mounted tablet device, the user developed and free SmartTiles web client is simple to install and has a very clean interface. The interface isn’t as responsive as a local application would be, but it gets the job done. 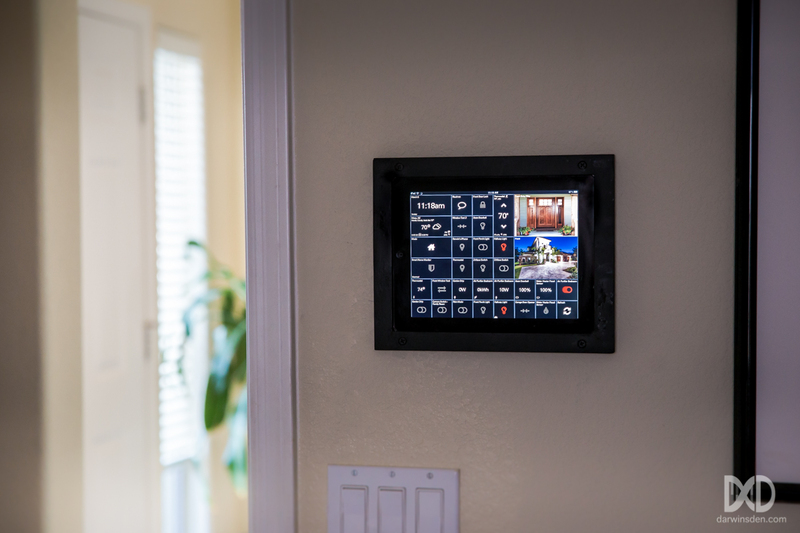 I was able to create a very capable smart home console running SmartTiles on an otherwise unused iPad Gen 1 that I wall mounted in an 8×10 wooden picture frame. I do wish SmartThings would support direct sensor control when connected to your local home network, and I wish they would allow user developed apps to execute on the local hub. A several second delay for rule execution from a user developed app can be annoying at best, and at worst, enough that I would recommend a different controller with dedicated local rule execution capability for those that need timely responses to customized rules. 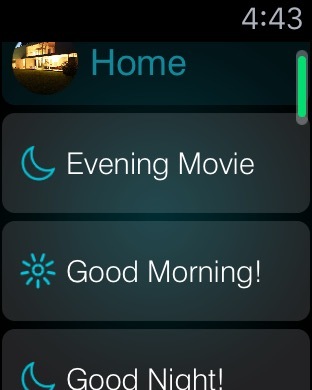 The SmartThings Apple Watch app provides a simple and flexible interface. The application’s only control interface option is through “routines” that you define on your mobile device. A routine is effectively a scene, or collection of one or more device actions that you would like to execute at the same time via your phone, Apple Watch, or automatically via SmartApps. In order to say, open your garage door from your Apple Watch, you can a make a simple routine that does nothing more than set your garage door device to Open. This is not as tedious as it sounds, and keeps the watch widget from presenting what could be an overwhelming number of device control options by default. Interfacing the SmartThings Hub with our Amazon Echo was straightforward and quick. Within minutes of including the Echo, I was able to issue voice commands to turn on and off my kitchen and from porch lights, and to adjust the temperature on my Nest thermostat. The reasonable price of the SmartThings Hub, multiple protocol support, and IFTTT integration make this a prime contender in the Home Automation Controller market. Protocol support for Z-Wave, Zigbee, and Bluetooth LE decrease the likelihood of this controller becoming obsolete the day after you purchase it. The ability to download or write your own driver device types and SmartApps using the SmartThings web IDE environment helps to ensure compatibility with a wide range of devices, including those that may just be hitting the market. 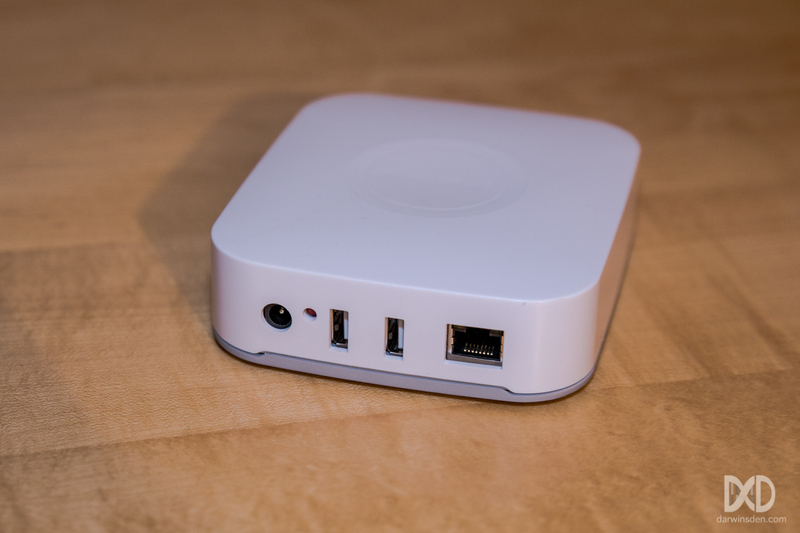 With the V2 SmartThings Hub, Samsung has moved some of its processing to the local hardware. I would hope and expect this trend to continue with future software and hardware updates, but for now, it is still, unfortunately, reliant on the internet for most of its capabilities. The flexibility of the SmartThings platform and rapid growth of the user community also comes at a price of the occasional glitch and system bottleneck. The aggressive approach of supporting and encouraging user developed content ends up being a risk/reward decision for both SmartThings and its user base. Personally, I’m willing to pay the price of near-term system stability for the impressive flexibility and user community support that the SmartThings platform offers. SmartThings does not currently provide a means to back up your configuration in the event of a data loss or hub hardware failure event. This may seem like a minor issue for the majority of users that have just a few automation devices and associated rules controlling them, but for power users that may have hundreds of devices and thousands of lines of scripts that control them, this is a significant concern. In the event of a hub hardware failure and replacement, you have no choice but to manually re-implement your system from scratch – ideally with the help of notes and screenshots that you have diligently maintained along the way. If your home automation or security needs are mission critical, or you are the type of person that gets terribly annoyed with the occasional glitch, the SmartThings Hub may not be for you. For those concerned about security and performance issues with cloud-based home automation solutions, all of the controllers listed in the Home Automation Controller Comparison table that are indicated as having Local Control capability, such as the Mi Casa Verde VeraEdge, Universal Devices ISY994i Z and HomeSeer Home Troller Zee S2 are very capable devices. While these devices may not have the same level of network interface or cloud and IFTTT service options as the SmartThings hub, they are worthy controllers in their own right and are capable of low-latency – and secure, local operation. Been sitting on mine since last fall when I got in on the deal for teh STv2 with 2 sensors for $99. This thing is NOT reliable. Sometimes the sensor disconnect from the Hub. Every night I get a message that “good night has been performed” but that does NOT mean that the doors are closed. I can open and close the doors and no alarm goes off. When did the sensors stop working or get disconnected? I don’t know. Maybe it was last night. Maybe it was a few months ago. Who knows. Customer support wants me to unplug the battery and try minor de bugging. Would not be a problem if I had known that it wasn’t working. I had to stumble on the fact that they were not connected accidentally. Oh, and it isn’t just one. It is three out of four that are no longer connected to the smart things hub. DO NOT BUY!!! Hi Talani. Sorry to hear you’re having issues. A built-in sensor/device health monitoring and reporting capability is definitely something that is needed by the SmartThings Hub. With the mesh networks employed by Z-Wave and Zigbee protocols, device reliabilities often end up as multipliers in the overall system reliability numbers. Although “sleepy” battery powered devices may report infrequently, even a single warning notification after a day or more of inactivity could go a long way in improving overall system satisfaction for many users. I know SmartThings is working on this capability, but as usual, haven’t announced an ETA for its release. In the meantime, although it’s not as ideal as a built-in hub feature, there are a couple of community developer SmartApps that can provide notification if a device drops offline after awhile. If you haven’t seen these yet, you might want to look at @krlaframboise’s Simple Device Viewer, and @erocm1231’s Device Monitor SmartApps.